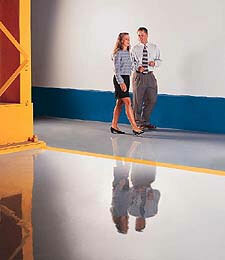 Our polymer flooring systems provide protection from abrasion, impact and most common chemicals. Our polymer flooring systems are used on interior or exterior, on dry or moist surfaces, at temperatures above or below freezing. Surface textures range from smooth "glass-like" finishes to aggressive "non-slip". Rapid cure for quick turnaround. The epoxy finishes are both flame and smoke retardant.